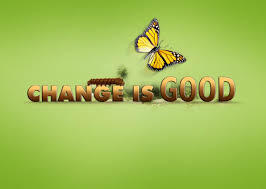 I’ve always heard and I once believed that change is really hard, but actually it is not! Change occurs all round us every day, with or without our consent! In fact, I heard someone say that the only thing constant is change! You say that you can’t change or that change is difficult? God forbid that it should happen, but consider these scenarios: Scenario #1: You are driving down the street and suddenly your car is broad-sided by another vehicle that failed to stop for the traffic light or the stop sign. You are seriously injured and maybe one of the occupants in your car dies! In a moment, in the blinking of an eye, your life has changed forever! Scenario #2: You’ve tried and tried, but you can’t bring yourself to stop smoking. However, when you go in for your annual physical, your doctor informs you that you are in the preliminary stages of lung cancer. However, there is a 90% chance that if you stopped smoking now, the cancer would never develop fully. Would you find it really difficult to change if your life depended on it? In both of the afore-mentioned scenarios the impetus for change came from an outside source and it was forced: change happened! It didn’t take long for it to happen and in the first case, it was instant! But why is it that we can change and will more readily accept the necessity for change when it is forced upon us? Why can’t we just change simply because there is a need or a benefit to change? I want to suggest that change is really not that difficult! It’s not the change that’s difficult; it’s the idea, the preparation, the getting ready to change that’s difficult! And that wouldn’t be difficult if we would just change our attitude towards change! We don’t like change because change forces us to confront the unfamiliar. Change forces us out of our “comfort zone” which, in many cases is just another word for “rut,” which is nothing more than a grave with no ends! Change is going to occur! You can’t stop it! So wouldn’t it be better? Wouldn’t you have more control and more power in your life if you initiated the change? Wouldn’t it be better for you to happen to change than for change to happen to you? Take a look around! Take a look within! And then, take the initiative: Make the changes instead of allowing the changes to make you! A young woman complained to her mother about the hardships and difficulties in her life. She didn’t know how she was going to continue and wanted to give up. The young woman said, “I’m tired of fighting and struggling. It seems that as soon as one problem is solved, a new one appears.” In response, her mother took her to the kitchen and filled three pots with water, placing each one on the stove over a high flame. “Carrots, eggs, and coffee,” the daughter replied. Her mother brought her closer and asked her to feel the carrots. She did and noted that they were soft. The mother then asked the daughter to take an egg and break it. After peeling off the shell, she observed the hard-boiled egg. Finally, the mother asked the daughter to sip the coffee. The daughter smiled, as she tasted its rich flavor. The mother replied that each of these objects had faced the same adversity, boiling water, and each reacted differently. The carrot went in strong, hard, and unrelenting. However, after being subjected to the boiling water, it softened and became weak. The egg had been fragile, its thin outer shell protecting its liquid interior, but after the boiling water, its inside became hardened. But the ground coffee beans were unique – after they were in the boiling water, they’d changed the water itself. The message? The real issue is not what happens to you, but rather your response to what happens to you. You can be soft like an egg, but allow life to make you hard. You can be hard like a carrot, but allow life to break you and make you soft. Or you can be like ground coffee beans; use your adversities to change life into something wonderful like the coffee beans changed the water! Instead of life changing you; you change life!